� Entering the 2009 AVP season the highest seed Rutledge had ever had was 12th, but that year she was seeded at least once in each position from first through ninth. � Rutledge has improved her AVP season points ranking by at least 15 positions each year from 2005-2009. � Rutledge has advanced to the AVP main draw the last 11 times she has played in a qualifier. � In April 2010 Rutledge and Brooke Hanson emerged from the qualifier in Brasilia as the 25th seed to place fifth, becoming the lowest seeded qualifier team to garner a fifth-place finish or better in FIVB history. 2010: Rutledge continued to play with Hanson, with a best of seventh three times on the AVP Tour. On the FIVB Tour, Rutledge and Hanson started the year in Brasilia as the 25th-seeded qualifier team, and finished with a career best fifth-place. They did not advance from the qualifier in three of the next four FIVB events. Rutledge then began a partnership with Ashley Ivy, placing seventh in their first two AVP tournaments and 17th in their first FIVB event. 2009: Rutledge formed a partnership with Brooke Hanson, and the duo advanced to six semifinals on the AVP Tour, including the championship match in her first ever trip to the semifinals in San Diego. The duo played two FIVB events but did not make the main draw in either tournament. 2008: Rutledge and McHenry advanced to the main draw in their first three tournaments, with a best of ninth. In the next three events they were seeded directly into the main draw. For the final seven events, Rutledge played with Romias, placing ninth four times. Rutledge was second in blocks per game (1.18). 2007: In 10 events with McHenry, advanced to the main draw nine times, with a best of 17th four times. She also played one tournament with Julie Romias, finishing 17th. 2006: Playing with McHenry, advanced from the qualifier in four of nine events with a best of 13th. 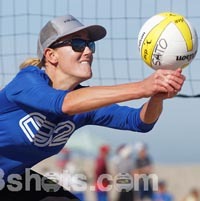 2005: Rutledge made her beach volleyball debut in a qualifier in Manhattan Beach with Angela McHenry. College: Rutledge played at Arizona, where she was all-PAC-10 in 2001 and a member of the AVCA All-Pacific Region team in 2001 and 2002. Arizona advanced to the Final Four in her junior season, and Rutledge served the final five points in the deciding game at USC in the regional finals. She was also named a Verizon Academic All-American in 2002. She graduated with a degree in Psychology. Personal: Rutledge began playing volleyball in her grandparents' backyard when she was 10. She was a member of the USA Junior National Team in 1998 and 1999.